Acts 27:5 When we had sailed across the sea which is off Cilicia and Pamphylia, we came to Myra, a city of Lycia. 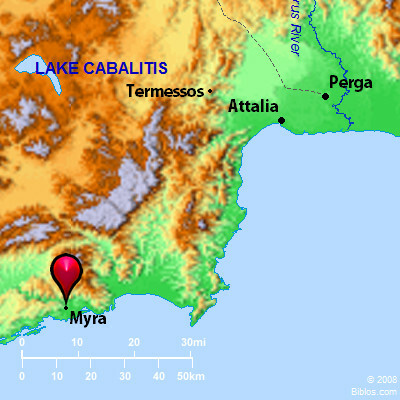 mi'-ra (Mura): A city of the ancient country of Lycia about 2 1/2 miles from the coast. Here, according to Acts 27:6, Paul found a grain ship from Alexandria. The city stood upon a hill formed by the openings of two valleys. At an early period Myra was of less importance than was the neighboring city Patara, yet later it became a prominent port for ships from Egypt and Cyprus, and Theodosius II made it the capital of the province. It was also famed as the seat of worship of an Asiatic deity whose name is no longer known. Nicholas, a bishop and the patron saint of sailors, is said to have been buried in a church on the road between Myra and Andraki, the port. Here an Arab fleet was destroyed in 807. In 808 Haroun al-Rashid, the renowned kalif of Bagdad, took the city, and here Saewulf landed on his return from Jerusalem. Dembre is the modern name of the ruins of Myra, which are among the most imposing in that part of Asia Minor. The elaborate details of the decoration of theater are unusually well preserved, and the rock-hewn tombs about the city bear many bas-reliefs and inscriptions of interest. On the road to Andraki the monastery of Nicholas may still be seen. MY'RA, an ancient port of Lycia, on s.w. coast of Asia Minor, about 2 1/2 ms. from the mouth of the river Andriacus, with magnificent ruins bn a hill called at present Mee-ra.